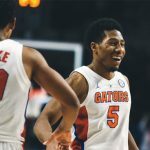 The Florida Gators ended their late-collapsing ways on Saturday, outscoring the Georgia Bulldogs 19-4 down the stretch to pull out a 62-52 victory in Athens, Georgia. 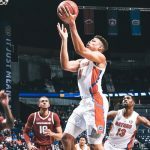 The Gators (10-7, 2-2 SEC) and Bulldogs (9-8, 1-3 SEC) entered the game with identical records, and the victory was a crucial one for Florida as it ended a stretch in which it lost three of four games despite holding large leads in every contest. Let’s take a look at what went down in Florida’s latest win. It was over when … Senior guard KeVaughn Allen hit two free throws to put the Gators up eight with 19.9 seconds left. Though the Gators had a big lead late, it never felt like it was enough considering the team’s recent end-of-game failures. Two free throws increased UF’s advantage to 10 in the waning seconds as it finished Saturday’s contest on a 19-4 scoring stretch. Florida led by as many as 13 in the first half and took a 10-point lead into the break, but Georgia was dominant coming out of halftime. The Bulldogs outscored the Gators 19-7 to open the second half with the hosts erasing their deficit and taking their first lead of the game with 13:44 to play. It took UGA just 9:30 to score 23 points in the second half, the same total it posted in the first 20 minutes. Down by five, its largest deficit of the game, UF forced six turnovers and took off with a 12-0 run capped by a corner three from Allen to go up seven with 3:36 left. Ninety seconds later, a falling left-handed layup by Allen kept the lead at seven, and Florida was able to ride that advantage to the finish. Exceptional efforts: Allen did not have a great shooting performance, but he scored when it mattered most — late. Five straight points, including the aforementioned three and tough layup, pushed Florida ahead in the final few minutes of the contest. Allen finished 3-for-7 from downtown with a team-high 13 points on the afternoon. He was the only player on the Gators to make four baskets. Important injury: Redshirt junior forward Keith Stone was having a great game, going 3-for-4 from the field, when he attempted a magnificent block early in the second half, leaping high in the air to send the ball flying. Not only did Stone get hit with a foul, he landed hard on his left knee and was sprawled out writhing in pain for a few minutes. He limped doff with the help of two trainers and never returned. What it means: Is this the sign of a turnaround? 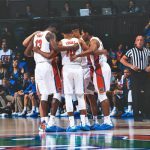 Probably not considering Georgia entered the game with an identical record to Florida, but you cannot deny the fact that the Gators did exactly what head coach Mike White and fans have been demanding for weeks: They finished a game. Florida’s defense fueled its late surge, and a 19-4 game-ending stretch is nothing to thumb one’s nose at. 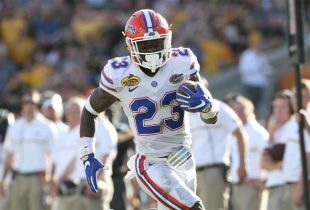 The questions are whether it will continue and whether UF can figure out a way to stop seeing its double-digit leads disappear early in the second half. Up next: Florida will play at home for the first time in 10 days when it hosts Texas A&M on Tuesday at 8:30 p.m. ET. The game will air live nationally on SEC Network.